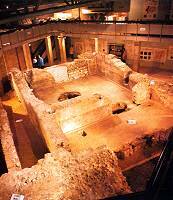 The Roman Painted House, the finest Roman House on show in Britain, was discovered by Kent Archaeological Rescue Unit. Twenty five years of excavation across ancient Dover by the Unit have uncovered 50 major structures. The Painted House was the best preserved and is now a major tourist attraction. Built about A.D. 200 it formed part of a large mansion or official hotel, for travellers crossing the Channel. It stood outside the great naval fort of the Classis Britannica, but in A.D. 270 it was demolished by the Roman army during the construction of a larger fort. Three of its main rooms were then buried substantially intact under its ramparts. The burial by the Army resulted in the unique survival of over 400 sq. 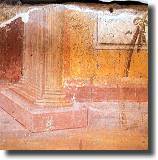 ft. of painted plaster, the most extensive ever found north of the Alps. Above a lower dado, of red or green, visitors can still see an architectural scheme of many coloured panels framed by fluted columns. The columns sit on projecting bases above a stage, producing a clear 3-D effect. Parts of 28 panels survive, each with a motif relating to Bacchus, the Roman God of wine. The walls in four rooms survive to a height of 4-6ft. and the hard red concrete floors cover substantially complete central-heating systems. Visitors can see the large arched flues, the various heating channels and the vertical wall-flues that kept the building comfortably warm 1,800 years ago. In the Galleries are 30 display panels which tell the story of the discovery of the Roman House and the development of Roman Dover. Some of the best objects excavated are on display. Visitors can also see a section of the massive Roman fort wall and great defensive bastion which were built through Rooms 3, 4 and 5 in A.D. 270 as part of the "Saxon shore-fort" system. With its spectacular Roman rooms, fine painted plaster, heating-systems, numerous information panels, commentaries (in four languages), cases of finds and a touch-table, schools from all over S.E. England and France now make day-trips to the Roman House. Often combining with visits to The White Cliffs Experience or Dover Castle, schools find the Roman House, with its gift shop for booklets and souvenirs, toilets and free parking, a major attraction. Guides are available for short talks if required. Trains and buses nearby. Free car parking on forecourt.